After an uncomfortable sleep (or lack there of..) in the car in freezing conditions, I woke early to go photograph the first light of day as it hit the peak of Cradle Mountain. My vantage point was a view through this old twisted tree at the edge of Dove Lake. Although setting up the tripod was difficult and correct framing took me a while, I like the result. It is a unique take on this famous Tasmanian location. The fog just added to the already beautiful scene and actually picked up as the morning went on. The bushes around me were frosted over and after 30 mins my tripod was showing signs of frost. 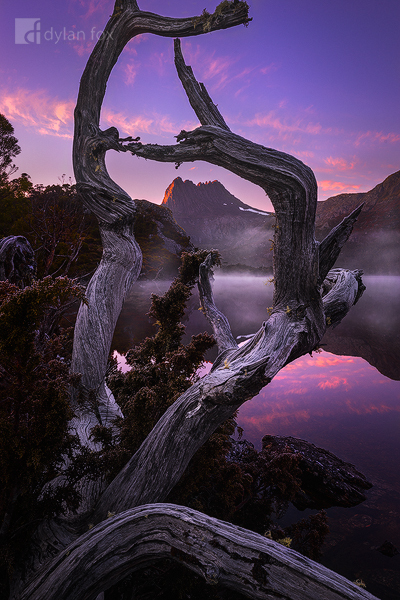 Secure your limited edition, Cradle Mountain print, 'Twisted', by selecting your desired print size in the menu to the right.